A cultivar of Prunus armeniaca L. ‘Medium size, nearly round, not compressed. Skin deep yellow; brownish orange next the sun, and spotted. Flesh pale yellow, firm, juicy, sweet, and pleasantly sub-acid, separating from the stone. Stone large, rugged, and impervious. Kernel sweet. Middle of August. [Hogg – Fruit Manual p.42/1860]. 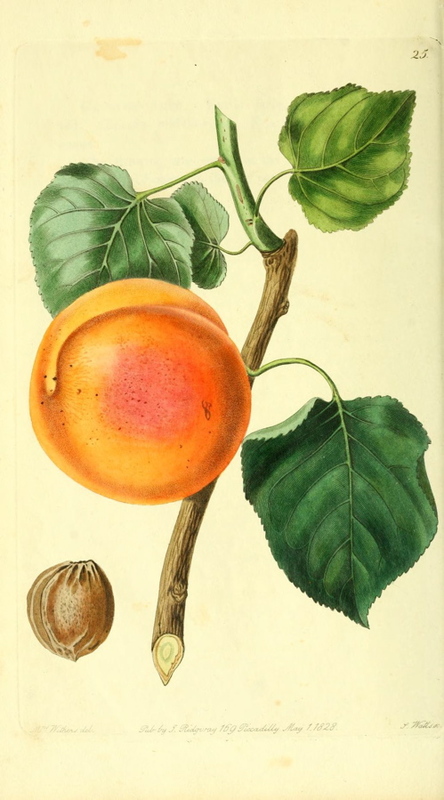 ‘An excellent Apricot, scarcely known in the Gardens of this country, but in good quality little inferior to the Moorpark, from which it is to be certainly distinguished by its figure being round, not compressed; its skin much more transparent, and less deeply stained with red; its stone without an open passage through it; and especially by its kernel being sweet like an almond, not bitter. About London it ripens on a south wall in the middle of August; on an east or west wall it would, of course, arrive at perfection rather later. No garden in which Apricots are valued should be without this. Duhamel says that it is sometimes called the Abricot Peche: but we believe all the trees in this country known by that name are the Moorpark.’ [PM t.25/1828]. A first quality apricot. Ripening in August. [Proc.RHS 1862-1865’. PB pl.XIX/1812. Listed in the 1845, 1850 and 1857 catalogues [Apricot no.3/1845].